The Ford Ranger is a popular pickup truck that originally debuted in 1983 as a smaller alternative to the F-Series. The Ranger was discontinued in the United States after the 2011 model year, but it is making a comeback in 2019. Since this is the first time the Ford Ranger has been manufactured in eight years, almost everything about the pickup truck has been completely changed. The biggest change is the new body style. The 2019 Ford Ranger is now a mid-size pickup truck, which is much larger than the prior models. 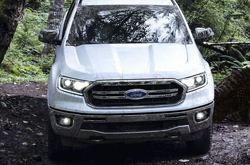 The 2019 Ford Ranger has two distinct trim levels. The SuperCab model comes with four doors, but the rear doors can only be accessed after opening one of the front doors. The SuperCab Ranger also comes equipped with a six-foot bed. The SuperCrew model is also available this year. This version of the pickup comes with four full-size doors, but it only has a five-foot bed. The SuperCab can comfortably seat four passengers. You will be able to fit an extra person inside the SuperCrew thanks to the larger interior. Both trim levels come equipped with the same features. 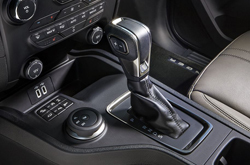 A few of the great features you will find in the 2019 Ford Ranger include cruise control, LCD touchscreen infotainment system, hands-free compatibility and voice recognition software. How Much Power does the Ford Ranger Have? Engine power is very important when it comes to pickup trucks because they are regularly used to haul heavy items. You will never have to worry about engine power when driving the new 2019 Ford Ranger. The pickup truck features a 2.3-liter I-4 engine that delivers 270 horsepower and 310 foot-pounds of torque. This strong engine will let you carry up to 7,500 pounds at one time with your new truck. Another great thing about the new 2019 Ford Ranger is that the powerful engine will not cost you a lot of money at the gas pump. The new Ranger will get approximately 21 miles per gallon in the city and 26 miles per gallon on the highway. Safety is a majority priority for every vehicle manufactured by Ford, and this is no different with the newly redesigned Ranger. The pickup comes equipped with a long list of excellent safety features to help you avoid a dangerous accident. 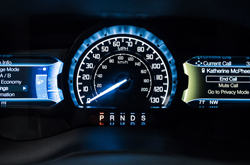 The most important safety options offered in the new Ford Ranger are traction control, assisted braking and a low tire pressure warning system. 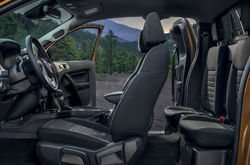 While the 2019 Ford Ranger has not been crash-tested yet, you can rest easy knowing that everyone in the pickup is protected by the six airbags and seat belt pretensioners. Learn more about the 2019 Ford Ranger by coming into our Peoria dealership and taking a test drive.